In the electronic jungle, one animal rules the page view counts and claims millions of followers every second. Who is this powerful creature that tames even the wildest corners of the Internet? Cats are the not-so-secret key to Internet superstardom, an online phenomenon that has taken social media and the web by storm. Internet cats have climbed their way to the top of the viral hit lists with memes and short YouTube clips. ‘Surprised Kitty,’ a 17-second video of a kitten getting tickled, has received over 68 million views and counting. 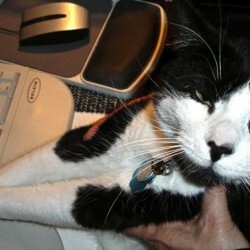 Keyboard Cat, a piano-playing tabby in a blue T-shirt, has over four thousand videos to his name. And then there’s the Lolcat Bible Translation Project – a translated version of the Bible in lolcat language, which imagines how felines would speak in mock English. It’s the gospel according to cats. Yes, cats now have their own web speak. But the web is no longer big enough to contain this kitty craze. The Internet cat machine is now heading offline as well. Later this month, the first feature-length cat video, Lil Bub & Friendz, will debut at the Tribeca Film Festival. The documentary film stars an A-list of online cat celebrities – Lil Bub, Grumpy Cat and Nyon Cat to name a few – charting the rise of these kitties and how fame has changed their lives. Produced by Vice, a Montreal-based media company, the movie explores the ever-growing obsession with Internet cats. Online superstardom has also set the stage for the Internet Cat Video Festival, which held its first event in August last year. 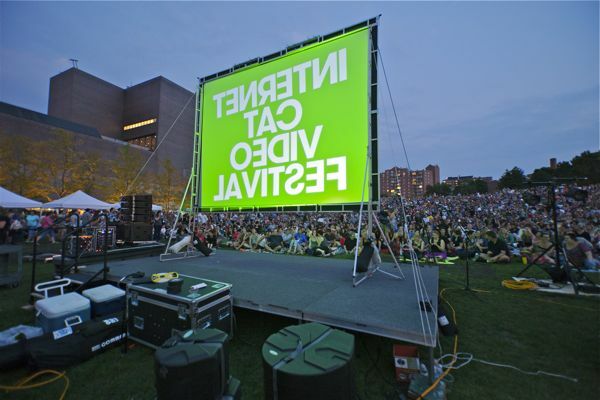 Hosted by the Walker Art Center in Minneapolis, the festival is aimed at bringing furry feline fans together in person. For the first one-day event last summer, the center screened 74 minutes of cat clips, compiled and cut down from over 10,000 user suggestions. 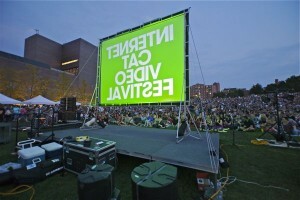 Thousands of fans watch a selection of cat videos at the Internet Cat Video Festival in Minneapolis last summer. Photo courtesy of the Walker Art Center. Cat Stevens and Cat Power covers blasted over the crowds, as people celebrated in feline friendship. “It was like a rock concert,” described Stulen. And music wasn’t the festival’s only connection to rock concerts. Thousands of fans flocked to the grounds, decked out in band T-shirts with a pussycat twist. The public interest is now propelling a five-city American tour for the Internet Cat Video Festival, including dates in California and Oregon. So why the fuss over felines? There has been a social interest in cats for much of human history. The ancient Egyptians revered cats, depicting them in art and religion. Centuries later, superstitions in the Middle Ages associated cats with witches and plagues. Puss in Boots made his debut in the late 17th century while cartoon characters Krazy Kat and Felix the Cat came to prominence in the early 1900s. American cat cartoons continued their popularity in the 20th century, with the likes of Tom and Jerry and Sylvester of Looney Toons fame gracing TV and movie screens. Cats also appear to have made the jump from the fringes of the web to mainstream culture. And capitalizing on cute is the latest trend. Big names in the business have agents and media teams, hoping to turn page views into dollar signs. It’s a market Bobbi Graham, an Ottawa-based writer, has tapped into. Graham’s six-year-old cat, Terzo, blogs regularly. “The point of the blog is to drive people to my website,” she said. Terzo also maintains an online network, corresponding with his own pet fan club, the MEWSical Society. And she’s certainly in purr-fect company. The Internet is transforming cat ownership from a solitary existence to an extremely social pursuit. After all, it’s fairly easy to attribute human traits to cats. “People just love the idea of a cat voice,” said Graham. It’s a voice on the Internet that delivers anything from humorous anecdotes about life to sarcastic commentary on human behaviour. 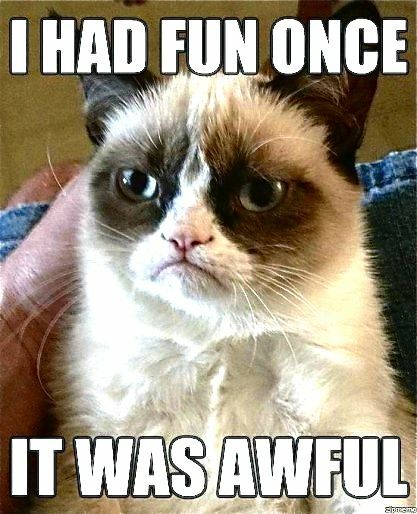 Take Grumpy Cat, a beloved four-pawed Internet celebrity. “I had fun once. It was awful,” reads her most popular meme, the words overlaying a picture of the stern-faced, glaring pet. 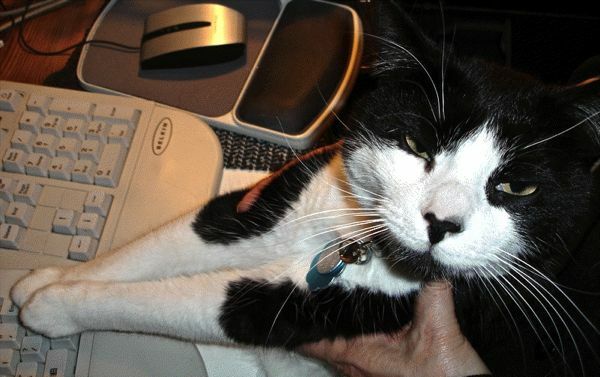 Graham, a member of the Cat Writers’ Association, has experience in this department. Terzo is her third cat correspondent, a hobby she has successfully continued for 30 years. With each cat, Graham has to reimagine her writing approach. The Internet offers a unique environment to share these personalities and collaborate with like-minded individuals. The idea of connections is an important one for cat lovers. While dog owners are out regularly walking their pets and meeting at dog parks, cat aficionados are relatively housebound. Online dogs receive attention too – the guilty dog trend has reached millions – but the pet popularity prize goes to the cats. Participation is a big factor, but so too is competition. Just like the dog park, Internet cat circles are also a place to show off. But viewer beware. Not all Internet cats are created equal. In fact, many of the cat moments caught on camera or tape are manipulated. But perhaps that will be the ultimate test of kitty staying-power on the Internet. As long as they’re cute and entertaining, do people really care if cat videos or memes are edited? Or will we ever really understand why the whole feline phenomenon has taken off? Well, coming up with those answers may be about as easy as herding cats. Emily Leighton is a master's student in the journalism program at Western. She has a BA in History from Carleton University and recently completed an internship at the CBC bureau in London, UK.